This bumper selection pack is truly impressive, chock-full of Marsh Pig's entire range. Marsh Pig are very proud of what they have achieved with their multi-award winning range, and they want to share it! Perfect as a gift for a serious charcuterie lover, or for impressive charcuterie boards at events. Plus by purchasing this, you'll make a saving compared to buying everything separately. 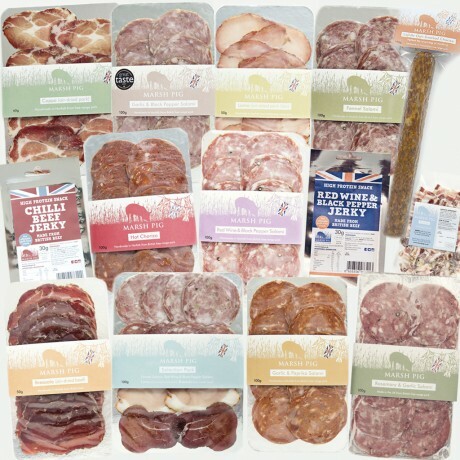 Marsh Pig lovingly craft all their award-winning British charcuterie by hand. They believe only in the highest standard of welfare for British Livestock, and so only ever use Free Range Pork, and Rare Breed and Rare Breed cross British Beef. Shelf life: minimum 10 weeks for the sliced products, 5 months on the whole chorizo and 4 months on the jerky. Jerky: Ingredients: Rare breed British beef, soy sauce (Soybean) Worcestershire sauce (Barley & Fish), chilli flakes, garlic, dextrose, black pepper, cinnamon, fennel, star anise. Hot Chorizo: Ingredients: Free range pork 89.41%, salt, hot smoked paprika, garlic, black pepper, dextrose, oregano, cayenne pepper, preservative (sodium nitrite). Gluten, Wheat and Lactose free. Oak Smoked Chorizo: Ingredients: Free range pork 80.82%, fat, salt, paprika, dextrose, black pepper, oregano, coriander, preservative (sodium nitrite). Gluten, Wheat and Lactose free.